Can you imagine being a Jewish priest in the Temple on the day Jesus died on the cross? I think it would make an interesting story told from their perspective. 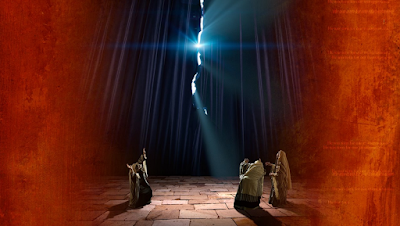 One day, you’re tending the Holy Temple and the curtain separating the Holiest Place in the Temple—the place that was supposed to be the earthly dwelling place of God’s presence—is torn in two, from top to bottom. The curtain (also called a veil) symbolized how people were separated from God by sin. Only the High Priest was allowed to pass beyond the veil, and only once a year on the Day of Atonement to make a sacrifice for humanity’s sin. Can you imagine being a priest in the Temple and seeing that sacred parament mysteriously torn completely in two before your eyes? The significance is this. Sin no longer has to separate us from God. Jesus was the perfect Lamb of God and his sacrifice on the cross atoned completely for our sins. Before Jesus, no one could go fully into the presence of God; only the high priest, once a year after very carefully spiritual preparation, could go in to make a sacrifice and beg God for mercy and forgiveness. But then Jesus died on the cross and paid the price for our sins in full! Now, there is absolutely no need for a curtain to separate us anymore! Everything has changed. Gone are the days of spiritual elitism where only a select few are allowed access to God. Everyone can come to Him now. In fact, the Bible says everyone who trusts and follows Jesus is a holy priest. We don’t have to tip toe around God, fearful that He may strike us dead for the least transgression. Now, grace abounds and we can relate to God as Jesus did—as children with a gracious and loving father.